White Man put off his sorry look. I’m sure it was because he thought he was about to learn something. We all know that having something new to learn makes him happy. When he reaches for his notebook and pencil, he’s as happy as a man reaching for his wife. “To make it equal?” White Man asked. White Man made a noise. White Man shook his head. “Bamboo knife,” he said, as if he’d never heard that word before. White Man nodded his head, and wrote in his notebook. I don’t know what he wrote but I’ll tell you I thought he was writing to calm himself. I drew on my cigarette and blew smoke out my nose. “Later,” I said, although I did think he’d already worked it out. He should have, because that part was simple. “Yes,” he said, “I’ll wait. Dead men on the trail, one with no head, even or not even, and I don’t know yet what caused the fight.” He looked at me and raised his eyebrows. He was seeming himself again. White Man looked as though he was trying not to show his shock and unhappiness. I was sure he understood the reasoning, that one person was as good as another, but even so hearing about a child bashed to death against a tree was hard for him. White Man said nothing. He nodded his head. Indeed, what could he have said? That night, when I was thinking about what happened, I felt sure that I’d put some fear into him. But more important, I made him wonder who was the fiercer and more bloodthirsty, his people or mine. Perhaps that gave him something to think about, that his people took no care to make killings even, and ours did. If he did something that caused his people to fall upon us, he knew they would not stop until they killed as many of us as they pleased. DON MITCHELL is a writer and ecological anthropologist, born and raised in Hilo, Hawai'i (where he graduated from a public high school -- in Hawai'i, that's important). He has published academic works, poetry, fiction, creative non-fiction, and both published and exhibited photographs. 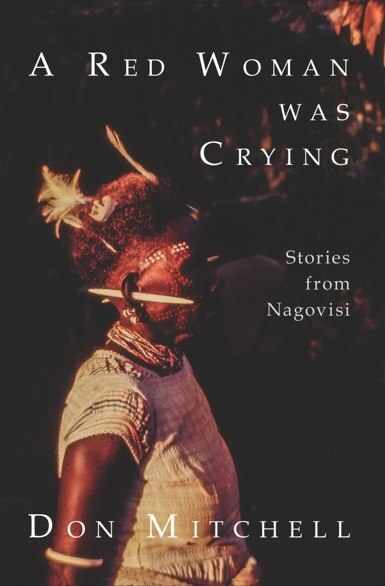 He recently published a story collection, A Red Woman Was Crying, and is working on a novel set on Bougainville Island, Papua New Guinea, where he did fieldwork. He lives happily in Hilo with his college girlfriend, a poet and yoga teacher, whom he lost for forty years but, lucky for him, finally found.